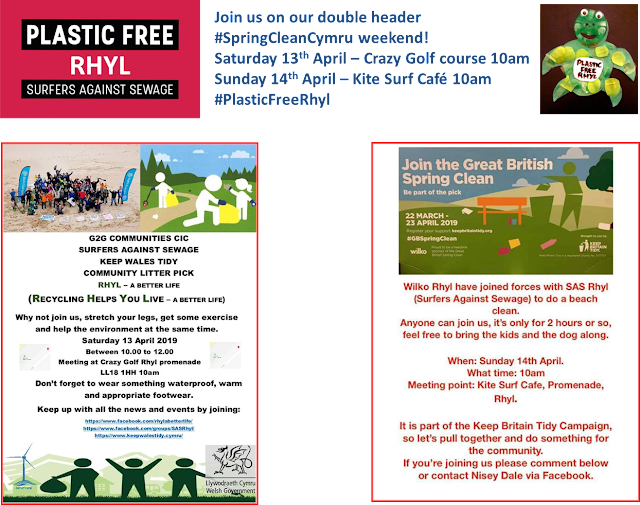 PlasticFreeRhyl: Beach Cleans this weekend! We're delighted at how much support our plastic free ethos is getting throughout our amazing town and community. This Saturday is our next #RhylBeachClean meeting at Crazy Golf, West Parade for a 10am start, supported by G2G and their plastic recycling project. Then on Sunday, it's over to the Kite Surf Cafe again for a 10am start, in conjunction with the Rhyl branch of Wilko. Usual rules, terms and conditions apply but mostly, all welcome, including well behaved dogs on leads, well behaved children (not on leads, but supervised by a responsible adult please!). There will be a safety briefing at the start and a sign-in sheet too. The weather forecast is for sunny spells but with a breeze, so it may be a tad chilly.